Secure your cutting board and press the meat with your hand to stabilize it. Slice meat horizontally through the middle, making sure not to cut all the way through. Open and flip the meat. 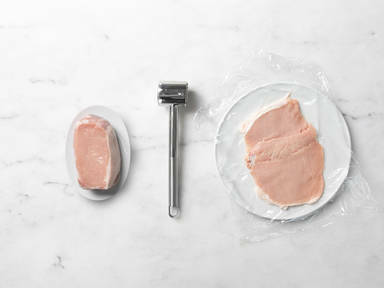 If desired, cover with plastic wrap and flatten the meat using a meat tenderizer. Use for cutlets, cordon bleu, and more!